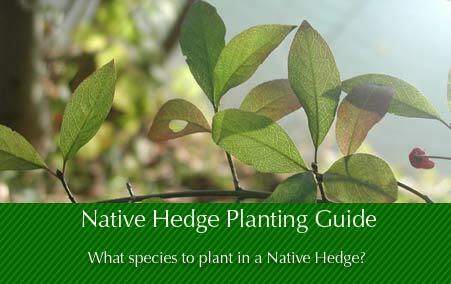 What species to plant in a Native Hedge? Planting a native hedge in your garden or around your land or woodland is a great way to grow a natural resource for native wildlife and to provide a feature of visual interest. 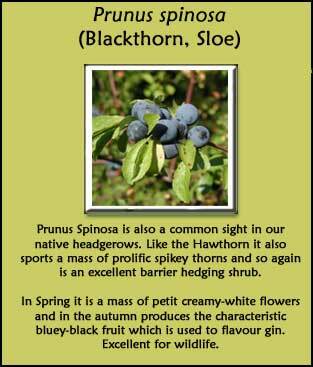 See below for our guide to the composition of a Native Hedge. Two species typically provide the backbone of a newly planted native hedge, with others mixed in amongst them. 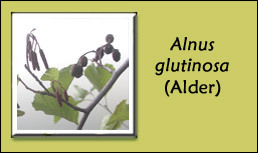 The Common Alder (Alnus glutinosa) is often found in hedgerows, it produces yellow catkins in March and attractive false cones, which provide a good supply of bird food in spring. Often seen in wet environments it is particularly suited to boggy ground, but not suitable for chalky soils. It is also particularly useful where rabbits or stock could damage the bark as it is rarely eaten by them. 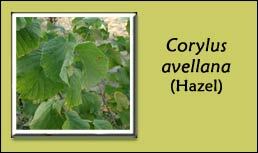 The Common Dogwood (Cornus sanguinea) is a native hedgerow shrub, which has a strong rich autumn colouring. 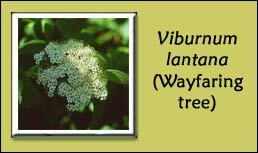 It has green stems which are flushed red throughout the winter. The berries, although inedible to humans, are enjoyed by and attract wildlife. 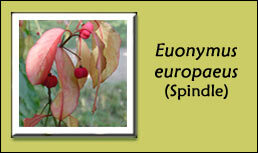 Spindle (Euonymus europaeus) is a large native shrub of European hedgerows. As it has a dense hard wood which was once used to make spindles. 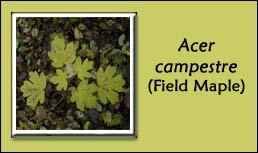 A great component of native hedges as it has a wonderful foliage in the autumn with vivid tints. Although in the summer the flowers are small and insignificant they do result in attractive unusual rosy-pink fruits which split open to form four winged lobes with a bright orange seed at the centre. Note: The fruit of Spindle (orange berries in the 4 magenta lobes are poisonous. This may have an impact on it's inclusion as a hedging tree in some situations. Alder Buckthorn Frangula alnus (Rhamnus frangula) produces spectacular autumn colour and provides habitat for the brimstone butterfly. It lays its eggs on the underside of the leaves in early spring and hatchling catterpillars feed on the emerging leaves and shoots. The small, white, clumpy flowers are followed by pendulous red berries which later mature to black in September, providing food for visiting birds. 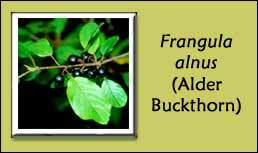 Note: The berries of Alder Buckthorn are toxic - this may have a have an impact on its inclusions as a hedging tree in some locations. Common Sea Buckthorn (Hippophae rhamnoides) has a dense spiny growth, it is hardy to severe winters and survives being cut back hard. It is an excellent hedging species. Its yellow fruit persists through winter so gives colourful visual interest and winter bird food. The plant is dioecious and so both male and female plants must be grown in order to obtain fruit production. For this reason is it necessary to include several in a hedge planting to ensure that both male and female are present. 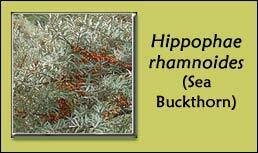 It is salt-tolerant and so it is useful as a costal hedging species. 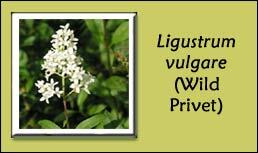 Wild Privet (Ligustrum vulgare) is a fast growing, dense hedge plant which retains its foliage all year round, except in harsh winters, making it an deal refuge for wildlife. 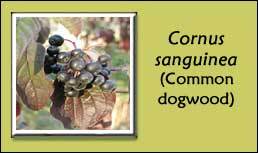 It produces clusters of creamy-white flowers in July, attractive to insects and long bunches of shiny, black berries in the winter. This makes it an extremely valuable resource for foraging birds when food is scarce. It is classed as semi-evergreen, therefore it will provide winter foliage for screening. 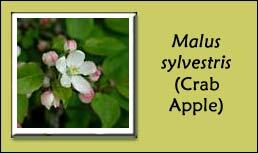 As well as being an attractive component of native hedges, producing pale pink, cup shaped flowers in early summer and rich yellow leaves in autumn, Crab Apple is exceptionally important ecologically. It supports over ninety different species and produces a large crop of fruit in late summer, enjoyed by numerous species of birds. 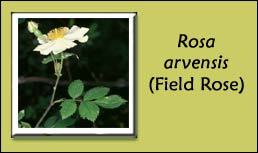 The Field Rose (Rosa arvensis) is a low growing, clump forming shrub, whose trailing purplish stems carry curved thorns. Its large white flowers (3-5cm in diameter) appear in late July/early August. they are followed by the production of a red, ovoid hip, which provides excellent food for birds. 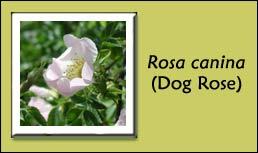 The Dog Rose (Rosa Canina) can be either self supporting or climbing, the tallest specimens invariably using other plants for support. Producing a mass of white and pink large flowers, they provide spectacular floral displays in hedgerows in June and July. By september the plant produces its famous scarlet, rose-hip fruit. it is an excellent source of vitamin C and loved by small birds which have the ability to extract the seeds contained within. 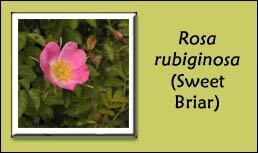 Sweet Briar (Rosa rubiginosa) is a strong growing shrub which forms a vigorous hedge. Its leaves and blooms are both exceptionally fragrant, with large bright pink flowers blooming from June to July, forming important habitat for numerous species of butterfly. It also produces bright red hips, maturing in August to October, whose fruit and seeds are consumed by birds. 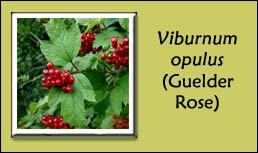 The Guelder Rose (Viburnum opulus) is a hardy, vigorous shrub. It produces large, white flowers from late spring to early summer. They are followed by bunches of small, bright red fleshy fruit which ripen to transparent in September and attract a variety of animals. 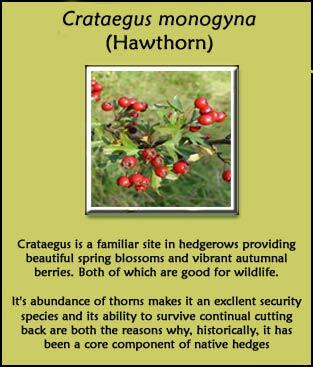 The plant possesses attractive, three lobed dark green leaves which turn bright red, to match the berries in autumn.